Bargello Quilts looks very intimidating however we found them to be quite easy! Bargello Quilts has a History Dating Back to the 17th Century! You will love piecing and sewing Bargello Quilts using the fast “Quilt- As-You-Go” construction method. This is an ideal way for the person looking for something that fits their limited time schedule. When you combine speed, beauty, and technical achievement in fascinating ways that only an artist would do, you produce something known as a type of needle-point embroidery. 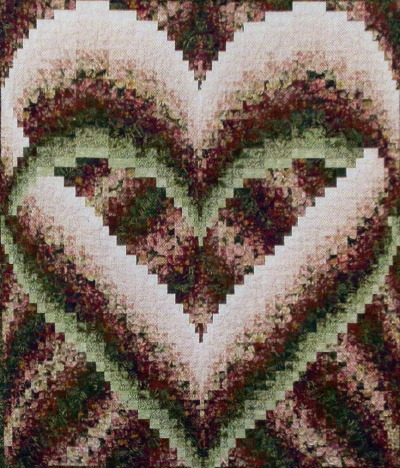 Bargello quilting techniques imitate this needlework tradition. More on this in just a moment. The origins of these quilts seem to come from across the pond. Here in the USA pioneers, Amish and colonial designs were the dominate quilting methods. Traditional designs are very colorful, and use many hues of one color, which produces intricate shading effects. The patterns are naturally geometric, but can also resemble very stylized flowers or fruits. 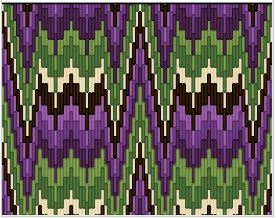 Bargello is considered challenging when making your first design, as it requires precise counting of squares for the mathematical pattern connected with the various motifs to accurately execute designs. However, this is easily mastered. Bargello is a type of needlepoint embroidery and originates from a series of chairs found in the Bargello Palace in Florence. In addition to Bargello embroidery, there are now Bargello quilts in which the patterns are constructed with strips of fabric of the same height but different widths. In Bargello quilting, long strips of fabric are sewn together along their long sides. Then the first and last strip are sewn together, forming a loop. The loop is laid flat on a table, and then cut vertically (in the opposite direction from how the strips were sewn together) to make many narrow loops. The quilter then opens the loops by pulling out the stitching between two pieces of fabric, making a long, flat strip. Finally, all the strips are sewn together. 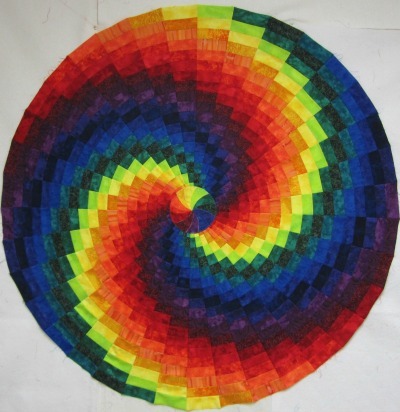 By opening the loops in between different pieces of fabric (for instance, between the first and second piece on one loop, then the second and third piece on the next loop), the artist can make the colors of the quilt appear to shift and wave. Slicing the loops very narrowly makes the waving and movement appear sharp and fast; cutting wide loops creates more gentle movement in the quilt. Bargello Quilts are Strips of Fabric with Same Height and Different Widths! Each wedge was cut from a 6-3/4 inch strip using a Ten Degree Twister Ruler and the two scraps on each side of the wedge are sewn together to form a second wedge. The quilt above is made from the scraps and the quilt below are the wedges that were first cut. Same colors but completely different looks! 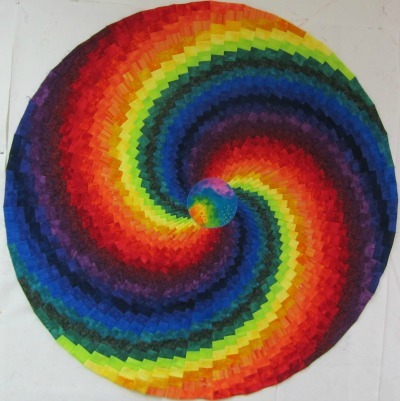 You will need a "Ten Degree Circle Wedge Twister" ruler (50 inch circle) and a "Cut a Round" ruler if you want to make the circle a square quilt. 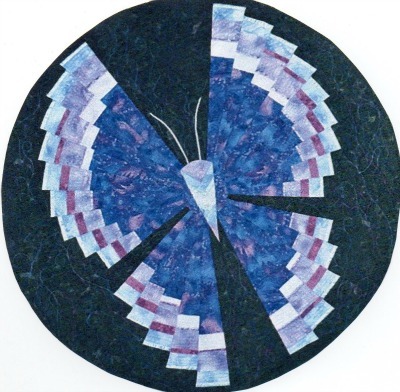 You will find the pattern in the book "Quilts Without Corners" by Cheryl Phillips. To get your hands on these tools just click either the name of the tool or the image...both will lead you to the right spot!